Oh no! You've archived a proposal that was supposed to remain active! Here's how to restore your archived proposal back to your pipeline. Well, crud! You were cleaning up your pipeline and you accidentally archived the proposal while it was still being reviewed by the client. Not to worry! Here's how to restore your archived proposal before the client even notices it was gone. IMPORTANT NOTE: Making edits to a signed proposal will void all signatures within it. Since "won" proposals don't count towards your proposal limit, it would be best to avoid archiving them unless you absolutely don't need to see it again. There you have it! Now your client will be able to view and sign the proposal. Can I restore an archived proposal with the signature still intact? At this time, we don't have that option available. You'll still be able to retrieve a copy of any won proposal in the archives from that proposal's Snapshot page. However, your metrics may still not look quite right. 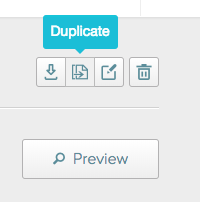 You can adjust your metrics by duplicating the proposal and manually marking it as "won".